The Grandville Avenue Business Association and Habitat Kent are installing light post banners to help showcase the neighborhood and local businesses. 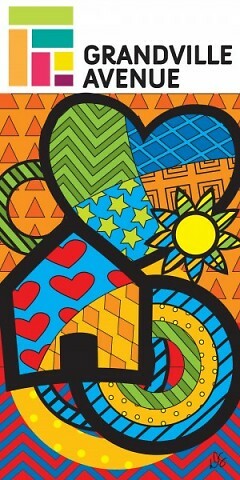 The winning banner, designed by Damon Shuck, received the most resident votes out of 23 entries. 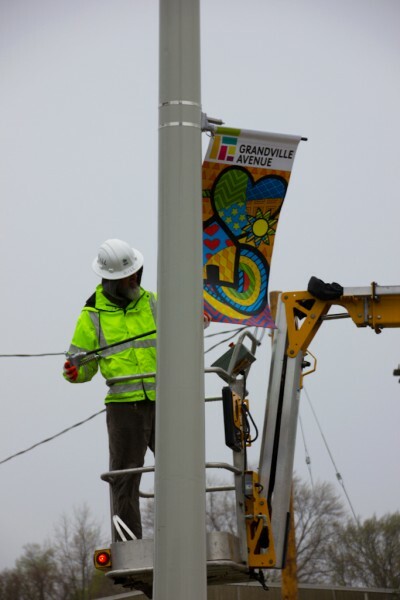 Grandville Avenue will be showcasing a bright new symbol this summer as the Grandville Avenue Business Association has developed light post banners to hang along a 1.5-mile stretch of the business corridor. The banners were created in partnership with Habitat for Humanity of Kent County, who applied for the Neighborhood Works America Grant last year that included the development of the banners. “The banners are a part of a collaborative effort to highlight the businesses, restaurants and culture that make Grandville Avenue a unique destination within the city,” said Ben Johnson, neighborhood revitalization coordinator at Habitat Kent. Local artist Damon Shuck created the winning design that had the most resident votes out of 23 unique banner entries. Johnson organized the local contest in 2015. The banner design focuses on the diversity and energy of the corridor and Roosevelt Park Neighborhood featuring vibrant colors, shapes, and the business association’s logo. The business association will be responsible for maintaining the banners throughout the year but a portion of the grant will support maintenance costs. This is one aspect of Habitat Kent’s neighborhood focused work in the Roosevelt Park Neighborhood and Granville Avenue Corridor. Habitat Kent has helped organize a neighborhood Curb Appeal Contest for a second straight year; they will be sponsoring the production of a neighborhood focused promotional video; a pop-up shop event during ArtPrize; and supporting an ArtPrize Oral History Presentation created by students at the Grandville Avenue Arts and Humanities Cook Arts Center.